On Mother’s Day I had the pleasure of attending a hands on workshop by none other than the Rebozo Queen herself Gena Kirby. If you don’t know who she is you can thank me later for introducing you 🙂 In addition to travelling around the country dishing out her refreshing and authentic brand of awesome (while teaching amazing techniques with the rebozo) she also has a great blog and radioshow that deals with a wide range of topics on pregnancy, birth and parenting; check her out! It was a great day of laughter, tears, joy and connection; I am so blessed to be in a place where I feel so fully supported by my professional community. 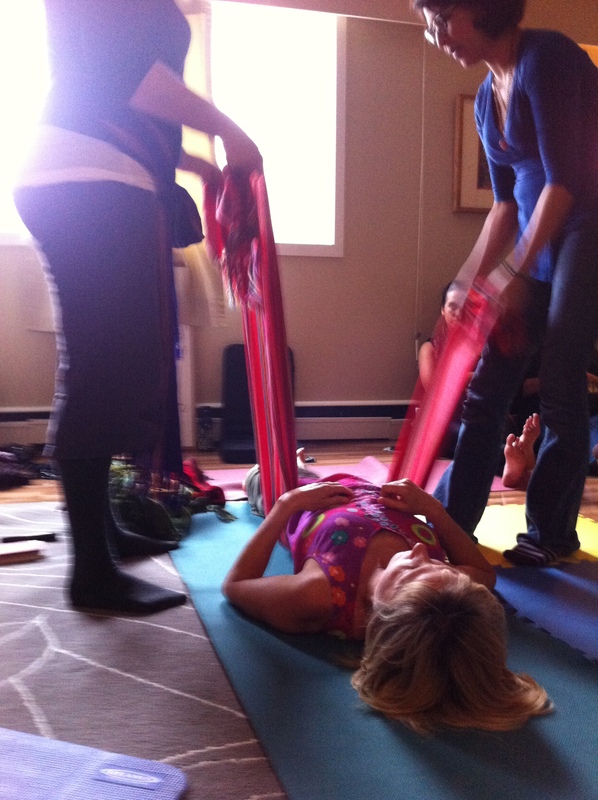 I was amazed at how much relief and relaxation this rebozo can bring, and I wasn’t even pregnant. These beautiful, handmade fabrics have so many uses labour and birth is just the tip of the iceberg! They can also be used as baby carriers, breastfeeding covers, and of course a beautiful shawl. They make great gifts for mothers to be, if you are interested in purchasing one check out the gorgeous ones that are fair trade from Laos here, imported in small batches they are truly unique and support a community of women weavers and their families. So how does this piece of woven cloth assist women in labour? You would also be amazed, it can be an extra set of hands for mama to lift her belly up to releive strain on the round ligaments (many pregnant mamas experience discomfort with this in the later stage of pregnancy), to fix a hot pack or cold pack to the lower back or belly and still be able to move around (great for mamas with babe no.2 in the belly as you are probably having to keep up to your other little one). In labour it can act as counter pressure on the hips and give your partner’s arms a break from squeezing, it can be used to relax a mama (or partner) and it gives a great handle to grab when pushing that baby out! One Ocean Birth is intended to be a resource for mamas and partners on the path of conscious birthing, mindful parenting and living a life of love and light.